Are automatic dog feeders reliable? How long can you leave a dog with an automatic dog feeder? How often do automatic dog feeders replenish dog food? What size dog food to use in an automatic feeder? Investing in a quality dog feeder or dog food dispenser is a great way to save yourself some time, since you won’t have to be there to fill up your pup’s bowl when they are hungry! It is the perfect solution for dog owners that work, for when you are held up at a social event, for dogs that like to eat very early in the morning and so on, and there are many different auto feeders for dogs to choose from – especially when shopping online. To find the best automatic dog feeder, you might need a few hints and ideas, which is what we are here for. A high-quality product will last long, provide your pup with timed meals and work as an invaluable helper to take one responsibility off that seemingly never-ending to-do list! It will keep your dog fed, full and happy, and give you time to attend to other pending commitments and responsibilities. With this automatic dog feeder, you can program up to 12 meals ahead of time, which saves time while also helping to keep your pet on a food schedule. Dogs enjoy routine and will often know when it is time for their meals, so providing their food at a specific hour is something that is sure to benefit everyone in the household. The container can hold up to 24 cups of dry dog- or cat food, and the bowl will hold a maximum of 4 cups. There is a setting that allows you to have the auto dog feeder dispense food at a slow pace over a 15-minute period, something that can help slow down a quick eater and prevent bloat and other stomach problems. Why We Like It – This is a durable and reliable automatic feeder for dog owners that want to make the feeding process easier. 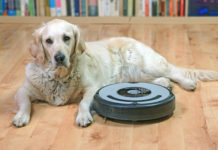 It is sturdy, has settings to fit dogs of all sizes, it is easy to clean and runs on batteries for convenience. Psst! This dog feeder would make the perfect gift for any dog owner! The 6L capacity of this timed dog feeder, you can program up to 4 meals per day, and have each meal divided into 1-39 small portions, depending on whether you want to control your dog’s eating pace (to prevent vomiting and bloat), or if your pup is fine to get access to his full meal right away. 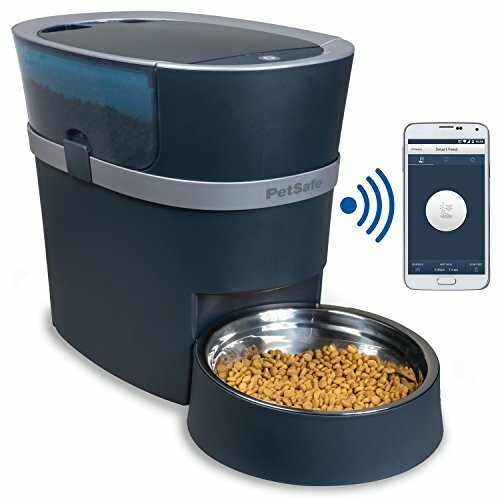 This timed dog food dispenser has a built-in voice recorder, which allows you to record a 10-second audio message to call your dog over for his meal. Your audio clip is then blasted through a small speaker right before a meal is released, to alert your dog that it is time to eat. The built-in infrared detection prevents food spill, and it is an electronic dog feeder that suits dogs and cats regardless of size and breed. Why We Like It – The low power consumption of these timed dog feeders makes the batteries last longer than many other similar products. 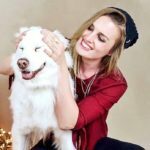 The option to record your own voice is a fun feature that will make it easier for your dog to know when it is time to eat. Got a picky eater on your hands, and worried they won’t eat? We’ve reviewed the tastiest dog foods for fussy dogs! Getting automatic dog feeders with timers for your dogs can be a great way of handling feeding when you are out of the house. This programmable dog feeder is controlled with your Smartphone (iOS and Android compatible), which means you can feed your dog his breakfast, lunch or dinner no matter where you are! 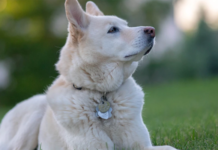 Your Smartphone app will let you know when your dog has had his meal, and when the auto dog food feeder is running low on kibble so that you are always prepared and aware of what is going on back home. The PetNet app also allows you to fill in your pup’s breed, weight, age, and activity level, to receive personalized feeding suggestions and recommendations. Why We Like It – Technology continues to develop and evolve, and most people have a Smartphone these days! With this automated dog feeder, you can keep track of your dog’s eating schedule through an app, regardless of where in the world you are! This dog automatic feeder is a simple and affordable dog food product that can be used for either kibble or water. Just fill up the container and see how it makes sure there is always food and H2o available for your pet to enjoy, which is great when you know you will be out for the day since you won’t have to worry about your fur baby running out. Not all dogs do well with having free access to food, but for those that do – these large dog automatic feeders will make sure there is always a fresh supply available. The large version (there is also a smaller container for small dogs) has a 2.5-gallon capacity for water and a 12-pound capacity for food, and it uses gravity to keep your pet’s food- and water bowl filled up at all times. Why We Like It – For those owners who free feed their dogs, this is a great product to have at home since it makes sure their food is always fresh! 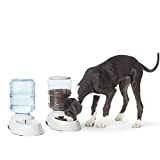 The bowl will refill itself as your pup munches away, and you won’t have to worry about him or her running out, or of the food sitting out for too long with this large dog food dispenser. We think you’ll love: Best Cheap Dog Kibble & Food. Do you have long work days, or are you going away for a trip? Perhaps you have a pet that likes to eat a little bit earlier than you like to wake up in the mornings? In that case, this electric dog food dispenser could be the lifesaver you have been waiting to find! 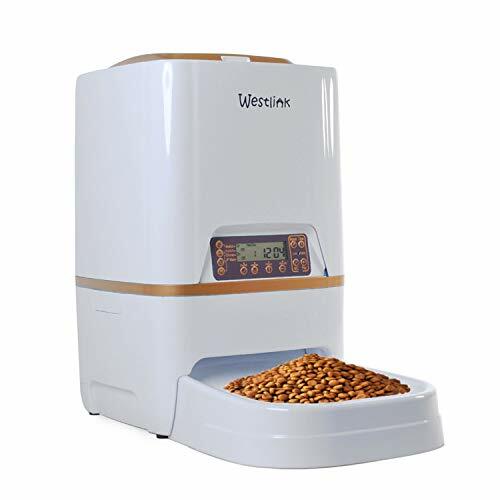 It has a digital clock and an LCD display, which makes it easy to properly time your dog- or cat’s meal, and you can choose for the large auto dog feeder to release small portions of food throughout the day – perfect for pets that eat too fast. The tray carousel and the removable bowl are dishwasher safe; making cleaning it quick and hassle-free, and the U.S based brand has a reliable product support available for any questions or concerns that might arise. 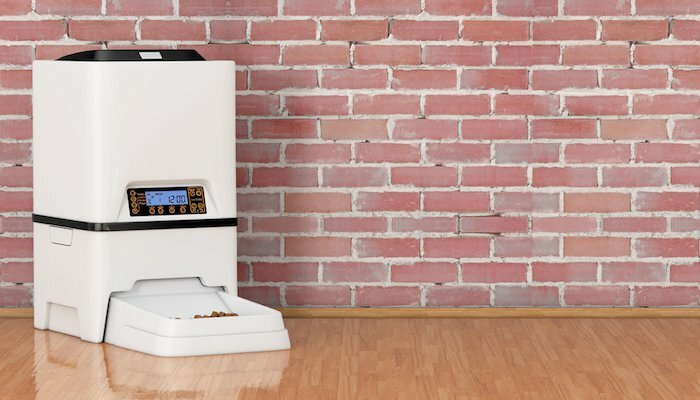 Why We Like It – PetSafe has created an easy-to-use programmable dog feeder, that will eliminate the problem of having to be home and ready to feed your pet at the time of every meal. The LCD display makes it simple to program a feeding schedule, and the estimated battery life is 9 months without having to replace them! Imagine being able to call your four-legged friend over for dinner even when you are not at home! It becomes possible with these automatic feeders for dogs since it has a practical function that gives you the opportunity to record a 10-second audio with your own voice – to let your pup know that the kibble is served. You choose how many meals you want to program a day, and in how many portions you want the automatic dog food feeder to split it into. Small portions (each portion released is 24ml) can help slow down an overenthusiastic eater and prevent serious medical conditions like for example bloat. This large automatic dog feeder can be connected to a power outlet with the included power cord or run on batteries. Why We Like It – The magnetic lock makes re-filling and cleaning easy and quick, and thanks to the reliable set up – your dog won’t ever have to wait for his meal again. Get organized by programming up to 12 upcoming meals with this automatic food dispenser for dogs! The settings allow for the meal to be dispensed from 1/8 cups and up to 4 cups, in order to work like a dog food feeder for pups all sizes. You can choose to receive alerts on your phone so that you can stay up to date with whether your pet has been fed or if perhaps it is time to refill the container. 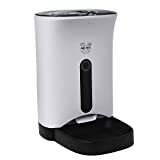 This PetSafe automatic dog feeder with timer continues to distribute food on schedule even if the Wi-Fi connection should be interrupted, so you never have to worry about an interrupted internet service leaving your dog unfed. The product is made with stainless steel and BPA free plastic, and you can wash the removable parts in the dishwasher. 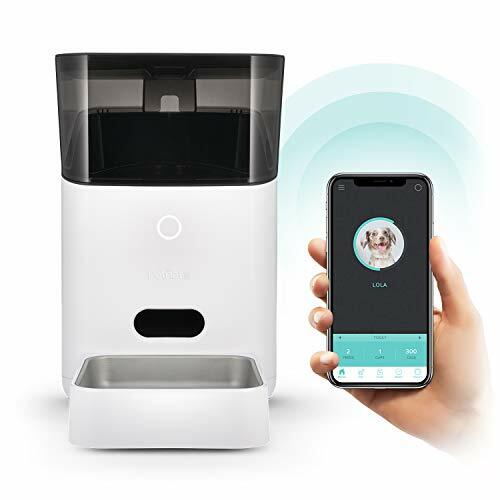 Why We Like It – This auto feeder for dog-loving households connect to the home Wi-Fi, and you can monitor your dog’s feeding sessions and schedule through an app on your Smartphone. Very convenient and easy to use, and the parts can be washed in the dishwasher to prevent bacterial build-up. It is no secret that life can get stressful at times, and it might be difficult to find time to pick up the kids from school, get dinner ready, finish the laundry and on top of that feed the dogs, and if that is a scenario you recognize, then perhaps it is time to start considering a dog feeder with timer. Automatic dog feeders help you make sure that your dog gets his or her food at the time of your choice, so that you no longer have to feel pressured when running late coming back from work, or if you have a day trip planned for which your pup is not invited. A timed dog feeder will have that dog food ready and served for ultimate convenience, regardless of whether you are home or away, and most products allow you to pre-program it for the next 12 meals or more. 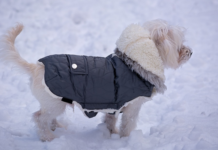 This, of course, does not mean that it is okay to leave a dog alone for too many hours, but it is an excellent aid for busy families with packed schedules. 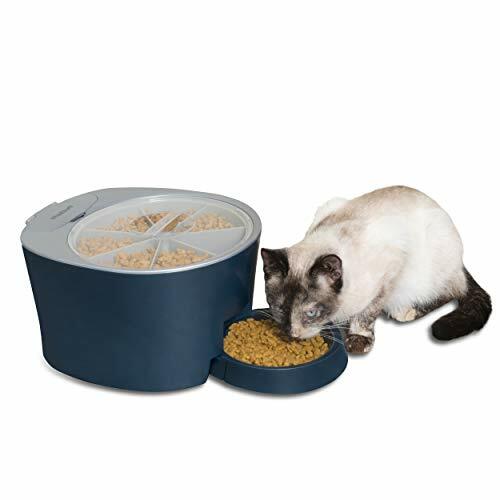 Once you decide to get automatic pet feeders for dogs and cats in the household, it is time to start looking at what type of product you want to purchase. You could get an electronic dog feeder with a timer, a large dog self-feeder for dogs that are okay with free-eating, or why not electronic dog feeders that connect to an app on your phone, so that you can stay up to date with what goes on at home? Different feeders serve different purposes, and the more you know before you make your decision, the better chance you have at getting it right. Timed release dog feeders run on battery or when connected to an electric outlet and have settings for you to program when you want your fur buddy to be fed, and how much food you would like distributed at each meal time. With an electric and automatic pet feeder, dog owners will no longer have to worry about their dog’s over-eating while they are away since only the exact quantity you have chosen will be released. Many products will also allow you to split a meal into several portions fed over the course of 15-20 minutes, something that is ideal for pets that gulp down their food a bit too fast. Eating too fast can cause bloat – a life-threatening condition – in dogs, and vomiting, which you can avoid by feeding less food at a time with the help of high-quality large automatic dog feeders. As technology continues to surprise us, it does come in handy when caring for our beloved pups. A timer dog feeder with built-in Wi-Fi makes it possible to connect it to the internet and monitor what is going on through an application on your Smartphone. You can usually see when and if the food has been distributed properly, and many apps send you reminders and lets you know when it is time to refill the kibble container. This was not possible only a few years ago, but these types of automatic timed dog feeders have been constantly gaining popularity ever since they hit the market. As a responsible dog owner, it is nice to be able to double check that your best fur friend has been properly fed while you are away. 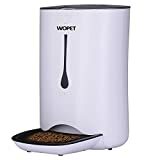 A more traditional option is the non-electric automatic small- and large dog feeder, which uses good old gravity for the food to constantly refill the bowl at the bottom. To use one of these, you need to have a dog that is used to having constant access to food, and that does well with it since not all dogs can handle having food out at all times. Free-feeding can cause obesity, which shortens a pet’s life, so make sure your dog eats moderately and know how to moderate his or her eating habits before considering a traditional auto dog feeder for large dogs, small dogs or other pets. A traditional feeder can in most cases also be used for water; so that your dog won’t ever run out of fresh H2o to drink. An automatic dog feeder is a device that provides your fur pup with food; either on a set schedule, or that makes fresh food available all day. Some automatic feeders run on batteries or electricity, and these can usually be programmed to have food dispensed at the hour of your choice throughout the day, while a traditional feeder (non-electric) lets food fill the bowl every time your dog eats so that it never goes empty. While all products can malfunction unexpectedly – most high-quality automatic large dog feeders are reliable and tend to continue fulfilling their purpose for years. It is of course up to the responsible dog owner to make sure it does not run out of battery (if battery-driven), that there is enough dog food left in the container and so on, since failing to do so could leave a hungry dog without his dinner. It is also important to make regular checks to make sure the product works as it should, such as double checking that it actually dispensed food once you get home (by checking how much food is left in the container, for example). As mentioned above – no product is 100% reliable, and even if the chances are good of your small- or large dog automatic feeder working as it should without a single issue – it is your responsibility as a dog owner to make sure your dog has been fed. The answer to this question is the same answer that you would get if asking how long you can leave a dog alone. An automatic dog feeder is not an excuse not to spend time with your pup, or to leave him or her alone for longer than you normally would or what can be considered humane. Remember that canines are pack animals, and while they can be home alone while you are at work or busy running errands, a dog should never be left alone for too many hours. 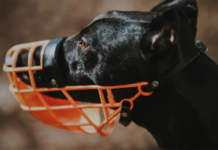 It is not good for them, and it can cause stress which often results in destructive behaviors; like excessive barking, digging, self-harm (licking, biting) and chewing on furniture or other forbidden items. Be responsible, and do not leave your dog alone for longer than you would if you did not have a feeder. Electric and automatic dog feeders will almost always give you the option to choose how often you want your dog to be fed. Many have the option of up to 4 times per day or more, and you can usually also choose if you want to split each meal up in several smaller portions. This makes it possible to adapt the feeder to your pup’s feeding schedule so that he or she can get his food at the times he/she is accustomed to. The only exception is the traditional and non-electronic feeder, which lets your pup have constant access to food. 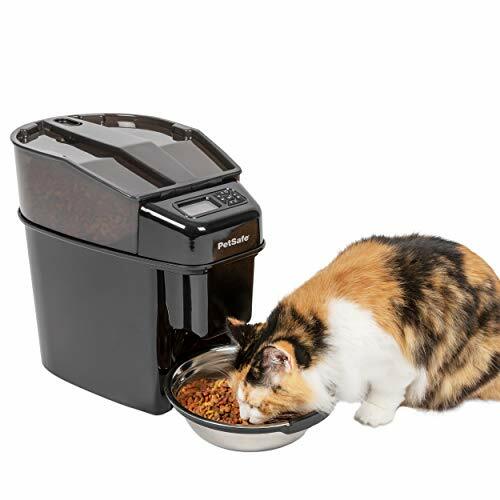 Most kibble is apt to use in an automatic feeder, so unless your kibble bites are unusually large, you shouldn’t have to worry. 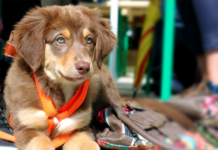 If you are unsure, there are many pet stores that hand out free kibble samples, so that you can test it in your automatic feeder before committing to purchasing a large bag. An automatic dog feeder is fun and easy to use, and your dog will quickly fall in love with it, once they realize that it provides them with their favorite kibble! They might be a bit skeptic at first, which is completely normal, so just give them a chance to get used to their new feeder, for the smoothest possible transition. Pick a product that fulfills your requirements and that will help you in your everyday life together with your four-legged friend and remember to always double check at the end of every day that it distributed the kibble properly. This usually isn’t an issue, but you don’t want to leave your pooch hungry if something would go wrong. Let your dog feeder be a help, not a substitute for your spending time with your dog and use common sense when deciding how long to leave your dog unattended. Keep in mind that while you have millions of things you could engage in and do – your dog only has you. Dogs are very good at telling time, so chances are they will already be standing by their automatic feeder at the time of food distribution!